This site is intended to assist consumers by providing comprehensive information on DeVere enlargers. Pictures and descriptions of recent DeVere models are provided. At present this includes the current models - the new 504 DS digital enlarger, 203, 504, 507, 5108, 508H, Metro and Vulcan; and discontinued models - 108S, 515, Apollo, 515H, 810H, 1010XLH, and 1010 ET. Information is also available on DeVere copy equipment - the C/F Repro stand and 480 copy camera. 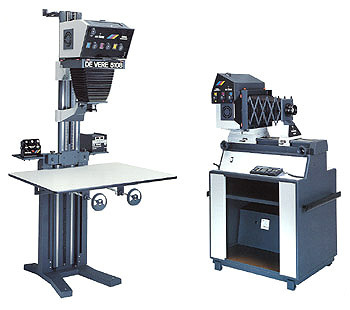 On the individual product pages, we list all the accessories for each enlarger, including catalogue numbers, and indicate the current availability of each item. A glossary is provided to clarify some of the terms and DeVere names used in the listings. Unfortunately, you have been directed to this special page because your browser does not support frames. We suggest that you update your browser or switch to another so you can access all the features of the DeVere Enlarger Guide.